When long-time Montgomery resident Carol Wolkoff sent her 24-year-old daughter Rachel to talk with Dedra Perlmutter, a career consultant at JVS Career Services, she had no idea the visit would result in new career opportunities for her entire family. Six months later, Rachel is happily settled in a new career. Carol’s son, Jeffrey, is excelling in his first job out of college. Her college-aged daughter, Samantha, is ready for the right internship. What’s more, Carol and her husband, David, have discovered that work can be fun again. Both have started new careers utilizing their existing skills in more satisfying and challenging ways. “JVS worked its magic for all of us!” said Carol. It all started with Rachel, who had a bachelor’s degree in nursing, but was curious if another career path might work better for her. Dedra updated Rachel’s resume, showed her how to network using LinkedIn, and administered several career assessments. “Turned out, Rachel has a very outgoing, extroverted personality and she decided she had an interest in becoming a recruiter,” Dedra said. The two worked over the course of regular sessions to build Rachel’s portfolio and prepare her for interviews. It wasn’t long before Rachel had landed a job with Maxim Healthcare Services, a home healthcare provider. “Dedra really helped me see that there were so many opportunities out there for career paths, especially in the healthcare field,” Rachel said. “Rachel met with me two times, and she said, ‘I have to send my brother!’” Dedra recalled. Soon, Dedra was meeting regularly with Jeffrey Wolkoff, who was about to graduate from the University of Cincinnati. “I was starting to apply for teaching jobs, and I was clueless,” Jeffrey admitted. The two worked together to make Jeffrey’s resume stand out by highlighting his coaching experience. They carefully put together application materials for him to take to an upcoming job fair, and they worked on his image. “I recommended he get a tie to help market his enthusiasm for the school he wanted to work for. He picked out a green tie that matched their colors!” Dedra said. “At the career fair, he got a lot of interest. Schools heard about his coaching experience, and they saw him standing out with his bright green tie,” she added, with a proud smile. After the fair, he got a number of calls from school systems with which he’d left his resume. Then it was a matter of picking the right offer and negotiating the best package. “When it was time to make a decision, I called Dedra. We walked through all the possible situations and we picked the best option for me,” Jeffrey said. He accepted a coaching and teaching offer from Hamilton City schools. It wasn’t long before the youngest Wolkoff sibling, Samantha, caught wind of the success her older sister and brother had through JVS Career Services. “After seeing their progress, I decided it was probably a good idea to start to schedule meetings,” said the University of Cincinnati business major. Dedra polished Samantha’s resume, and the two have been working on Samantha’s interviewing skills while Dedra continues to look for upcoming internship opportunities. “I now feel like I know I’ll have a future after I graduate college,” Samantha said. Having seen what JVS Career Services did for his three kids, David Wolkoff was hopeful Dedra could “work her magic” for him, too. “He hadn’t job searched 13 years, so he really had nothing put together that was anywhere near current,” Dedra said. She helped David define his background and get his experience formatted into an updated resume. The materials came together just in time for a facilities management opportunity that Dedra heard about before the job was even posted. She put David in touch with the hiring manager, and it was a perfect match. After having watched her entire family re-invent themselves, Carol started wondering if, after seven years as the Assistant Aquatics Director at the University of Cincinnati, there might be something better out there for her, too. What Carol thought might be an arduous job search came to an end in just two weeks, when two different employers called with interest. Thanks to Dedra, Carol’s resume was updated and ready to go in time. Dedra also helped Carol craft an exit strategy, which allowed her to leave the job she’d spent nearly a decade doing in time to take an exciting new position in administration at Sycamore High School. “My entire family is forever grateful to Dedra for her care and diligence. It transformed all of us!” Carol said. “JVS Career Services is batting 100% for the Wolkoffs,” her husband David chimed in. 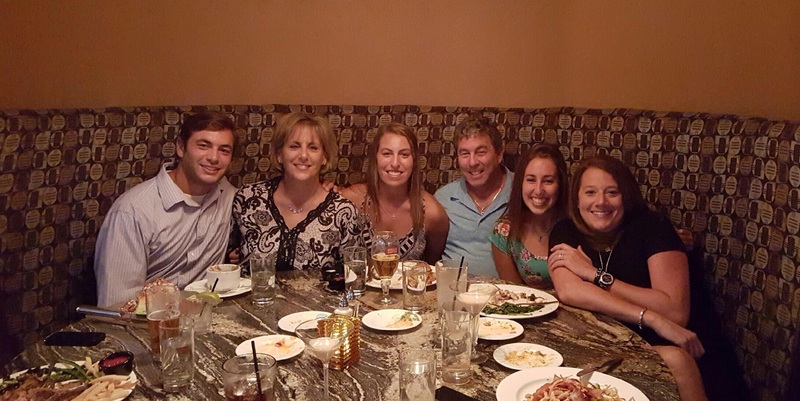 Dedra Perlmutter (right), JVS Career Consultant, with the Wolkoff family.